Given the doubts I expressed in this earlier post, I downloaded the NHTSA data and calculated the harmonic mean for the old and new vehicles in the 2009 Cash for Clunkers program. 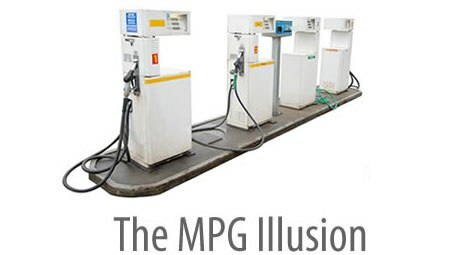 The harmonic mean prevents the MPG Illusion by first converting all car MPG values to gallons per mile (GPM), averaging GPM, and then converting it back to MPG. Well, that final actual MPG figure is a full mile per gallon below the reported figure of 24.9. That 1 MPG difference translates to 1.2 million tons of CO2 by the time those 677,000 new vehicles drive 100,000 miles. The supplement to the 2008 Science article discusses an "averaging illusion" example. That saves about 2 gallons of gas every 100 miles of driving, or 2 tons of CO2 every 10,000 miles of driving. It's a little late now to lament it. Amazingly, they have averaged the mpgs to get their final figure. Of course, they need to take the harmonic mean, which requires converting the mpg figures to gpm before calculating the final average. The harmonic mean is 24.2 mpg. So which is the real final figure: 24.9? or 24.2? Update: This post examines the data more closely and finds that the actual MPG of the new vehicles is 23.8.